The Neal Morse Band have released a lyric video of Long Day/Overture with Prog. The tracks are taken from their upcoming concept album The Similitude Of A Dream, which is set to launch on November 11 via Metal Blade Records. Speaking about the follow-up to 2014’s The Grand Experiment, Morse says: “The Similitude Of A Dream is loosely and sometimes directly based on the book Pilgrim’s Progress by John Bunyan which was originally published in 1678. “The book chronicles the spiritual journey of a man from the City Of Destruction to a place of Deliverance. Someone had suggested to me that I do a concept album based on this book – but I forgot about it. Then when I began writing new songs last December, the suggestion came to my mind. Portnoy adds: “Neal and I have now made 18 studio albums together, and I consider The Similitude Of A Dream the absolute creative pinnacle of our collaborations together. “I’ve always had a soft spot for double concept albums such as Pink Floyd’s The Wall and The Who’s Tommy, and I can bravely say that I think we’ve created an album here that can sit side-by-side with those masterpieces. The Similitude Of A Dream will be available on 2CD, a special edition featuring both CDs along with The Making Of A Dream DVD, and on triple vinyl. 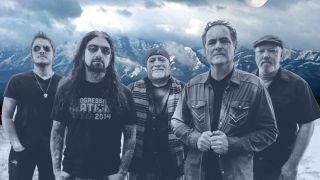 The Neal Morse Band will head out on tour in January across North America, before returning to Europe for a run of shows throughout March and April.